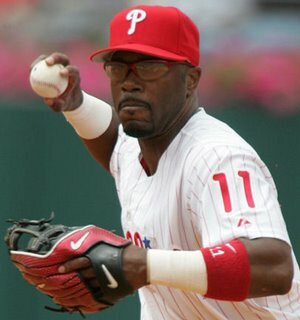 I wrote an article last year examining Jimmy Rollins and his odds of reaching Cooperstown. The piece was precipitated by comments he made regarding his desire to reach the Hall of Fame. The article that follows is an updated version of the piece that ran last year, comparing Rollins to various shortstops eying enshrinement in Cooperstown. Jimmy Rollins hopes to one day be recognized as one of the greatest shortstops of his generation, but statistically he falls short of being considered a guarantee for the Hall of Fame. For a baseline, let's first explore how Rollins compares to recent Hall of Fame inductee Barry Larkin. You see significant advantages for Larkin in batting average and walks. You also see a sizable difference in RBIs, but keep in mind the difference in games played (388 in favor of Larkin). Also, note the strikeout total in favor of Larkin. Digging deeper, EYE (BB / SO) shows Larkin as a more patient hitter than Rollins and that patience often equals more productive at-bats. You can also see a significant difference in Linear Weights (LINW) and Base Performance Value (BPV). These differences indicate Larkin's raw skills (i.e., eye, hitting safely, hitting with power, etc.) are better than Rollins'. 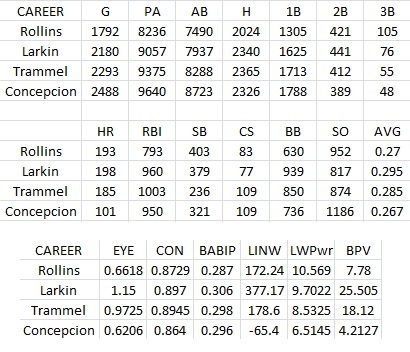 Larkin's BABIP (Batting Average on Balls Put in Play) also is significantly better than Rollins', reinforcing the logic that he was better at strategically placing the balls he hit. Larkin was inducted last summer, so the debate regarding the next shortstop worthy of the Hall of Fame now usually begins with Alan Trammell or Dave Concepcion. Trammell put up decent numbers over 19-seasons, making him comparable to Larkin. (Baseball Reference actually ranks Trammell as the most similar shortstop to Larkin.) Concepcion's offensive numbers are included simply to offer a fuller picture, though he pales in comparison to the other three shortstops. Offensively, the case is simple - Larkin and Trammell have better numbers than Rollins and appear more deserving. The tide changes slightly when looking at how the four rank defensively, but not enough in Rollins' favor to significantly alter his odds of enshrinement in Cooperstown. Rollins' fielding percentage is significantly better than the others while his error-to-chance number is outstanding. He also has three Gold Gloves, but so does Larkin; Trammell has four and Concepcion has five. Lastly, let's look at JAWS (Jaffe WAR Score system), a system built to measure a player's Hall of Fame worthiness. A player's JAWS is their career WAR averaged with their 7-year peak WAR. Rollins ranks higher than Concepcion but far behind Larkin and Trammell. Also, his numbers are significantly less than the average Hall of Fame shortstop. The numbers are convincing. Rollins is a great player, but he's not a Hall of Fame caliber shortstop. LOL, I mean conveniently you left Ozzie Smith, widely and popularly regarded as the best SS of the past generation off of this list. Ozzie is in the HOF, and Jimmy ROLLS over Ozzie on these metrics. Ryan, thanks for the read. I left those guys off because of the exact reason you mentioned - they already are in. The article was meant to compare Rollins to the guys on the outside looking in, except for Larkin, as he was the most recent inductee. For argument's sake, let's just look at JAWS (explained in the article) - The average SS in the HOF has a JAWS of 52.1 - Ozzie Smith has a JAWS of 57 and Phil Rizzuto has a JAWS of 35. Rollins has a JAWS of 35 too, but Rizzuto won 7 World Series', which certainly elevates his reasoning for enshrinement. Rollins does not have that going for him.